Please call owner David at 850-581-1139 or 850-830-9614. Boat is in Demopolis, Alabama. DESCRIPTION “Saltwater Therapy” has been a freshwater therapy boat for the past 10 years. She has served as a river cruiser and occasional week-end condo. She has been well-used, well maintained, and is now well prepared and reasonably priced for new owners. She recently (Nov ’16) completed a 350 mile trip down the Alabama River and up the Tombigbee River to Demopolis Yacht Basin where she was in dry dock for maintenance. She came off the hard and is back in the river at this marina. She is a fully quipped Silverton cruiser model with every available factory accessory except auto pilot. She has spent her life in a 12-month boating area; so, has been operated some practically every month through the years. The “Sidewalk” arrangement port and starboard makes it safe for crew moving forward for docking, locking, anchoring, or just hanging out on the bow. It has been especially handy for us in our advancing years. In fact, without it we would have probably been out of boating a few years back. After over 50 years of boating, I have found that boats fail due to lack of periodic operation. 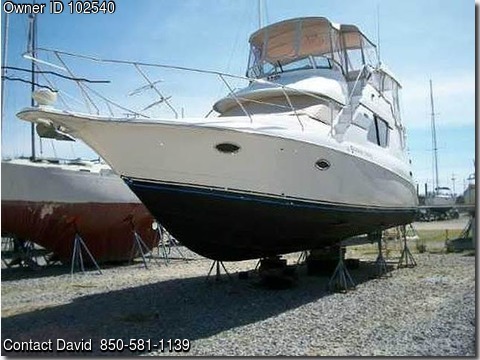 Any marine mechanic will tell you that boats are destroyed by rust, rather than use. All too often occasional boaters have arrived at their boats near us to find that there are major problems. Moist marine environments just do things to mechanical systems that are not used frequently. Saltwater Therapy has been used frequently and received periodic maintenance to prevent problems. Accordingly, she has served us well and is ready for many more years and hours of trouble-free service for her next caring owners. Demopolis Yacht Basin is located at the junction of the Tombigbee River, Black Warrior River and the beginning of the Tennessee-Tombigbee Waterway. This location is directly on the “Loop.” So, she is positioned to begin travels in either direction, i.e., clockwise or counter clockwise on the Loop to either Chicago, Illinois or Mobile, Alabama and beyond. Major maintenance to the tune of about $20,000 worth was accomplished during the Fall & Winter of 2016-2017. This included: Manifolds and Riser/Elbows Fuel Fill Lines Cutlass Bearings New Dripless Shaft Seals Props Computer Tuned Water Heater Plugs Impellers Bottom Paint (2 coats) Anodes (Aluminum to go in fresh or salt water) Rudder Packings Boot Striping Freshly Detailed She also has recent (2015-2016) Curtains, Canvas, Frig & Ice maker. If you are looking for a boat of this vintage (regardless of make or hours), you need to be sure that this type maintenance has been recently completed OR you will have it to take care of in the near future. This boat is solid and ready to travel anywhere --- except transoceanic. She does catch a lot of windage.